28-50 Wine Workshop and Kitchen, a wine bar and restaurant, is the brainchild of sommelier Xavier Rousset, one of the men behind the critically acclaimed one Michelin starred Texture which he owns with head chef Agnar Sverrisson and where I had a thrilling meal recently. The restaurant is so named as most of the world’s vineyards, in both the Northern and Southern hemispheres, are located within these latitudes. Rousset is a master sommelier with a string of awards to his name including the accolade of winning Ruinart UK Sommelier of the Year at the tender age of 22. It therefore seems fitting that Rousset would open up a wine bar and call it 28-50 Wine Workshop and Kitchen. I had such a thrilling meal at Texture recently I felt inspired to try 28-50 Wine Workshop and Kitchen. Despite its association with Texture, 28-50 Wine Workshop and Kitchen isn’t a Michelin starred restaurant. Rather what it purports to offer is decent French fare and a range of good wines at reasonable prices. 28-50 Wine Workshop and Kitchen has a choice of 15 red and 15 white wines by the glass, carafe and bottle. But most impressively, the wines by the glass include a 75ml option (from £2.15 to £20 for a 75ml glass), the beauty of which is the opportunity to try oodles of smaller glasses of different wines for less money than what you might otherwise have had to spend. 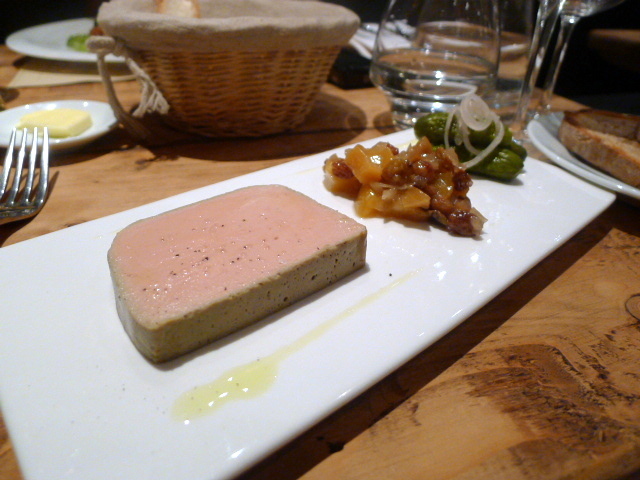 A foie gras and chicken liver parfait was wonderfully creamy, but it lacked a decent liver flavour and was more texture than taste. The accompanying peach chutney, with its rustic characteristics, worked well with the parfait. Less successful was the accompanying pickles which were so acidic that they were difficult to eat. A starter of ham hock and trotter ballotine, finished with an aromatic parsley persillade, was lovely. 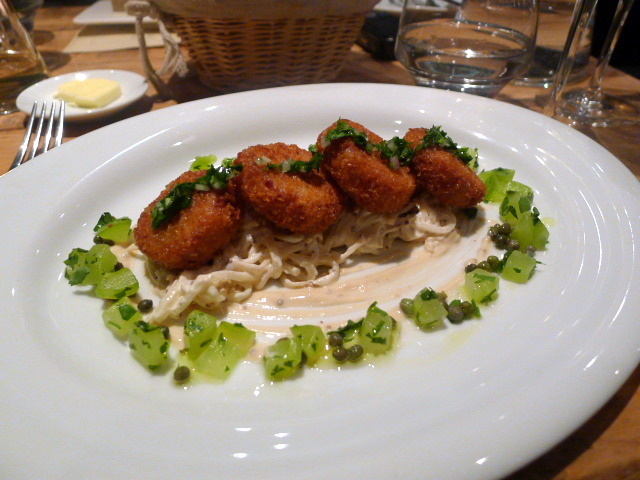 But it was the bed of celeriac remoulade which thrilled. Creamy, perfectly seasoned, and with the right balance of acidity, it highlighted the homeliness of the ballotine. 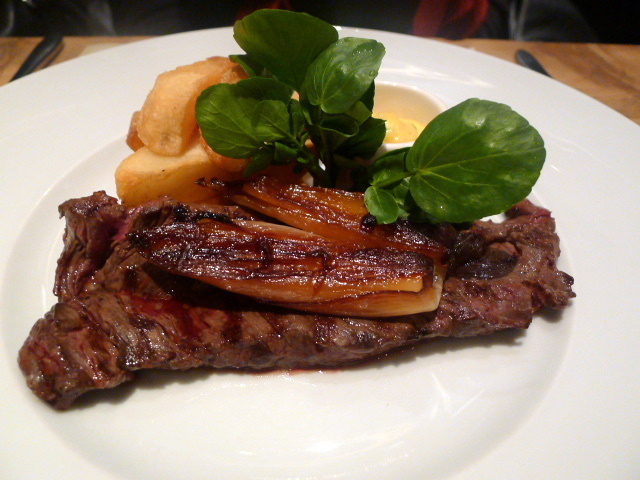 An onglet of beef was nicely cooked and tender, although it could have done with a bit more seasoning. It was served with crispy chunky chips and a well made choron sauce. Although simple, this was a very enjoyable plate of food. 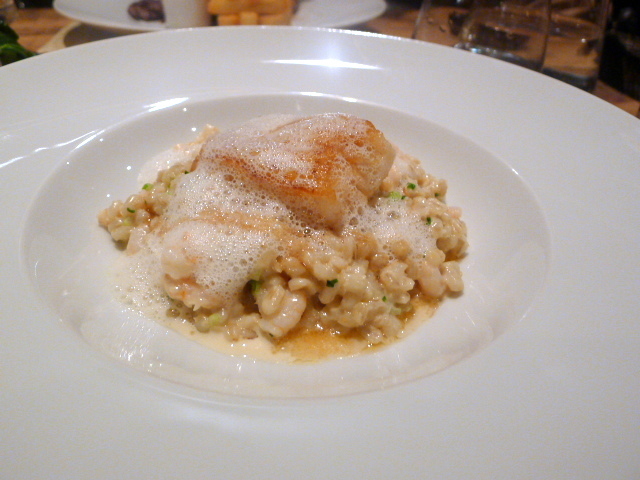 Icelandic cod was served on a bed of prawn and pearl barley risotto. The fish was well cooked and moist, but it didn’t taste all that fresh (albeit not ‘off’). Despite this, the pearl barley risotto, with its rich flavour and ‘al dente’ doneness, was divine. Furthermore, the hints of lemon in it were a clever contrast against the creaminess of the dish. 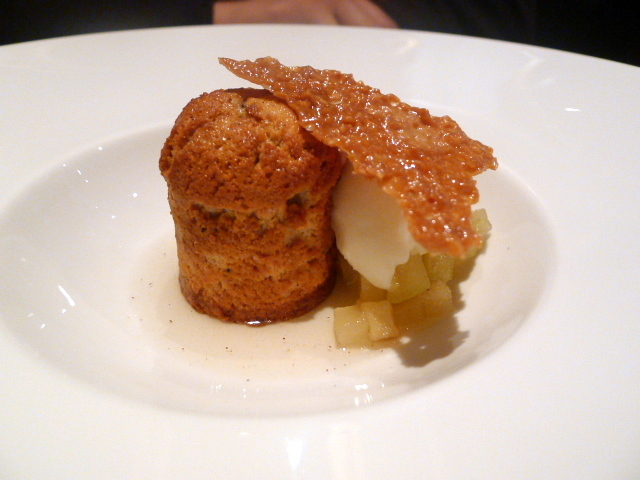 For dessert, an almond and cinnamon cake with pear sorbet (£6) was tasty, but unspectacular. The almond flavour that I was expecting was lacking, and instead, the cake boasted more of cinnamon overtones. The sorbet was pleasant, and garnished with an excellent brandy snap which was the best part of the dish. The food aside, the actual experience of eating at 28-50 Wine Workshop and Kitchen was a little hard work. The service was sporadic with forgotten drink orders. The timing of the food service was slightly uneven – it took ages to get dessert – and the barely padded wooden chairs weren’t particularly comfortable a spot to park ourselves given our two hour sitting. The surroundings lacked a certain warmth and homeliness. With the feel of a run-of-the-mill high street bar, I found it difficult to engage with this place, even though on the whole I enjoyed the food and thought that the prices were reasonable. When we arrived, the designated bar area was crowded with noisy drinkers, and their highly charged bar banter carried throughout the restaurant. 28-50 Wine Workshop and Kitchen is a wine bar through and through, and it lacks the ambience and dining appeal of places such as Vinoteca and Terroirs. The food at 28-50 Wine Workshop and Kitchen is pretty decent, but I had expected a little more finesse from the overall operation given that the people behind it are the ones from Texture. I wouldn’t pick 28-50 Wine Workshop and Kitchen over Vinoteca for the food or ambience, but for the opportunity to try their range of wines – yes. Price range: £26 – £30 for three courses. Excludes drinks and service. Despite the slightly boring surrounds (I know exactly what you mean there), I absolutely love this place. Simple but well done, lovely food and terrific wines by really knowledgable servers. It’s hard to beat Vinoteca though as an all rounder. I can certainly see this restaurant has its plus points. I am glad you love it. But I definitely agree about Vinoteca.